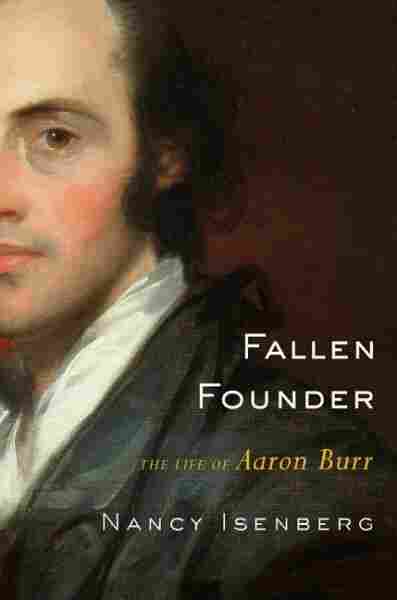 Excerpt: 'Fallen Founder' Nancy Isenberg's years of research have yielded a very readable history of Aaron Burr, a complex, elegant man. This biography was selected by Day to Day's Karen Grigsby Bates in her late-summer reading recommendations. See all of Karen Grigsby Bates' picks for late-summer reading. Aaron Burr (1756 – 1836) stands apart from the other founders—then and now. He is remembered, first, as the man who shot and killed Alexander Hamilton; second, as a vice president turned traitor; and third, as a womanizer. Historians have favored "nation builders" George Washington, John Adams, and Thomas Jefferson, whose published papers are voluminous. Burr has been left chiefly in the hands of imaginative writers: popularizers of history, novelists, playwrights, producers of cheap gothic romances, and even a pornographer. This is just the beginning of an explanation for why Aaron Burr has been mishandled by students of history—and textbook writers—for almost two centuries. Non-historians have written biographies of Burr, but this book marks the first time a professional historian has undertaken to tell his story. Oddly, even the most recent, and most respected, interpreters of the founding generation have unconsciously mimicked fictional portrayals of Burr. Historians have failed to do the legwork; that is, to read the bulk of Burr's papers on microfilm, scour old newspapers, and track down documents in archives. For too long, prejudiced characterizations of Burr have been repeated as received wisdom. Burr has been called many things, in ascending order of dangerousness: mysterious, mentally unstable, and congenitally evil—a shallow opportunist devoid of political principles. Moralizing has substituted for historical analysis. And yet, despite all the vitriol thrown at Burr, he had many reliable friends and large numbers of supporters, something his detractors still find difficult to explain. During his lifetime, friends and foes alike recognized that Burr was a skilled politician and an enlightened thinker; this underscores why he was considered a genuine national leader and a dangerous opponent, and why he rose to the U.S. Senate and the vice presidency. Unlike those founders who acted to secure their records in late life and who allowed aides to publicize their personal and political morals, Burr did not toot his own horn, nor did he defend himself with an eye to posterity. As his wife and daughter did not survive him, they could not do so either. Many of Burr's papers were lost in a shipwreck, and others were sold off, making a fuller reconstruction of his life difficult. Because of all that was said against him, and because he was, and is, admittedly, hard to know, attempting a fair assessment of Aaron Burr is a demanding task. Many of the lies and exaggerations that obscure the real Burr focus on his relationship to Alexander Hamilton. Historians have been too trusting of Hamilton's portrait of Burr, discounting his partisan motives in blackening Burr's name. Only half of that story has been told. Hamilton, an extremely motivated political thinker, was also a master of backroom politics. He was known for his poison-tipped pen, viciously attacking anyone he believed stood in the way of his political dominance. When it came to his sense of Burr as a competent rival, first in New York politics and later in presidential politics, Hamilton overreacted. He systematically sought, over a period of many years, to ruin Burr's chances through insults, slights, and writing campaigns. The great irony is that Hamilton routinely accused Burr of lacking a moral compass, when no evidence exists that the self-possessed Burr ever insulted Hamilton. The essential problem in Americans' understanding of the Burr-Hamilton relationship is that it has only been described to them in personal, pathological, or sexual terms. The relationship has been removed from politics, where it rightly belongs. To put it succinctly, it was not any issue relating to moral character, but Hamilton's aggressive style of politics that led to his duel with Burr. At the dueling ground itself, Hamilton gave Burr every indication that he intended to fire in earnest; not to waste his shot, as Hamilton apologists continue to insist to this day. How can history have gotten Burr so wrong? I can offer several suggestions. First, Burr was ganged up on by politically powerful combinations during his lifetime, his morals attacked merely as a political dirty trick. Next, he lacked a sympathetic posterity, whereas the other founders had legions of descendants responsible for celebratory publications. Finally, shoddy research over the years has plagued the study of both Burr the politician and Burr the man, reducing his legacy to oversimplifications, for which popular biographers are principally at fault. Writers tend to have an unconscious need to construct a narrative that features noble minds, courageous arms, and a foil (or black sheep) against whom the "good guys" are to be compared. The truth about most popular history is that even when it is not patriotically inspired, it is made up of dangerous shortcuts. As things stand, popular treatments disparaging Burr have proven quite seductive. History is not a bedtime story. It is a comprehensive engagement with often obscure documents and books no longer read—books shelved in old archives, and fragile pamphlets contemporaneous with the subject under study—all of which reflect a world view not ours. We cannot make eighteenth-century men and women "familiar" by endowing them and their families with the emotions we prefer to universalize; nor should we try to equate their politics with politics we understand. But this is what popular biographers do, and as a result, everything we think we know about Aaron Burr is untrue. It is time to start over.